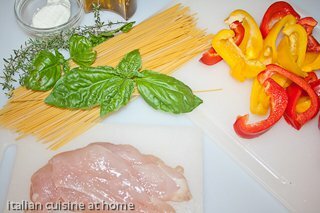 very tasty and light recipe for cooking spaghetti, one of our most appreciated recipes by Italian cooks and food critics. Useful if you have some grilled peppers. Notes to recipe: quick and light recipe made with light ingredients. 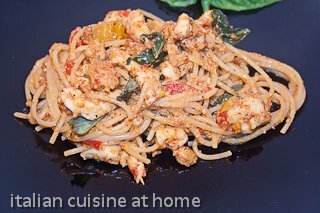 Chicken spaghetti is an original recipe of Italian cuisine at home, very appreciated by Italian cooks, and by people with alimentary restrictions. Whisk peppers and vegetable cream togheter for a creamy but dry sauce. Se in our recipe with pictures all the steps necessary for a very good dish. Vary good sauce for spaghetti for people not eating pork o beef meat.